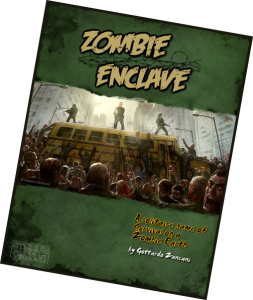 A new print-and-play zombie board game has just hit the internet, and it’s called Zombie Enclave. The game is meant for solo play, and is free to download. The game is in its infancy right now, and Gottardo Zancani expects many changes will be made to the game, as well as future expansions. In the game you’re playing as a survivor of a zombie apocalypse trying to find resource to add weeks onto your life. It’s an interesting take on the zombie genre, and I highly recommend you checkout the rules, and then download the game.